How do I get compensation for my injuries after an accident? Many Canadians experience a major motor vehicle accident at most once in their life. When such an event occurs, it’s crucial that we have a medical checkup to determine the severity of our injuries and that we continue to follow our doctors’ advice and treatment plans. Basically, we need to do whatever it takes to get better. The need to follow through on medical care after an accident is not only for the benefit of your wellness, as important as that is, it is also an important factor in qualifying for compensation. Anyone injured in a motor vehicle accident has a great deal of stress and decision making to contend with, in addition to their challenges with pain, medical treatments, vehicle repairs, and many other issues. In addition, when the aftermath of a collision is a new experience, many Canadians aren’t sure how to best proceed in terms of getting help in making a claim for our expenses and damages. When you are involved in a motor vehicle accident and sustain injuries as a result, there are two claim processes available to you. You are entitled to benefits under the vehicle owner’s insurance policy, for the damages to your vehicle and property and also for your injuries. In Ontario, everyone can claim for basic accident benefits regardless who was at fault in the collision, which is why these benefits are also termed ‘no fault benefits’. The second option for making a claim for compensation is to sue the ‘at fault’ person, and this option is available to anyone who was severely injured in an accident. This type of claim is called a ‘tort action’. A personal injury lawyer has the expertise to best advise accident victims and develop a good claim for compensation. Personal injury lawyers are specialists in tort law and insurance accident benefits. In Stoney Creek, the Injury Lawyers of Ontario (ILO) are personal injury lawyers who can counsel you in determining whether making a claim against the person negligent in your accident is right for you, given your unique circumstances. If you choose to go ahead with your claim for compensation, the ILO has the resources and experience to build a strong case. A personal injury lawyer can help accident victims who have been seriously injured to make a monetary claim for compensation against the negligent person(s) and their insurer. You can be compensated for the financial expenses and losses you have suffered, as well as for pain and suffering. Financial compensation for expenses that have arisen from your accident are called ‘pecuniary damages’, and are intended to allow the injured person to return to a level of functioning as close as possible to the level before the accident. Pain and suffering damages are called ‘non pecuniary damages’ and are a monetary amount given to compensate the injured person for their loss of enjoyment of life. A person severely injured in a motor vehicle accident, whether they were a vehicle occupant, pedestrian or a cyclist, typically requires treatment in a hospital; in some cases multiple surgeries; various rehabilitative treatments; and likely, a period of recuperation at home or a medical facility. They may also need help with daily functions, such as dressing, cooking, laundry and grocery shopping, or with home repairs and house cleaning. Many activities in which they previously participated for their enjoyment may no longer be feasible for them; these may include sports activities and vacationing. In many instances, the accident victim will not be able to work for an extended period, and perhaps never in the same capacity. Clearly, a collision resulting in serious injuries will have a significant impact on one’s life, sometimes permanently. The following are damages for which an injured person make seek compensation. The greatest financial loss for an accident victim is typically due to their inability to work. Injured persons are entitled to be compensated for any lost income up to the date of their settlement as well as estimated future income loss. Housekeeping and home maintenance expenses arise out of the fact that the injured person may be unable to perform many of the functions that they were previously able to do before they became injured. Medical and rehabilitation expenses may include psychological therapy, physiotherapy, chiropractic treatments or any other rehabilitative care that is recommended. Under the Family Law Act, family members of the injured person also have a right to sue for certain losses and expenses. In Ontario, in order for accident victims to receive compensation for pain and suffering their injuries must meet a threshold of injury severity. Essentially, the injuries must be severe and permanent, which is defined in section 267.5(5) of the Insurance Act as permanent and serious impairment of an important physical, mental or psychological function, or a permanent serious disfigurement. A ‘serious’ injury is one that substantially interferes with our ability to complete normal daily activities or that interferes substantially with the ability to be gainfully employed. A ‘permanent’ injury is one that involves long-term suffering and effects. Anyone suing for compensation for pain and suffering will also have a deductible applied against their pain and suffering award. A deductible of $36,540 is applied to any pain and suffering settlements under $121,799. If your pain and suffering is assessed at more than this, then there is no deductible. The cap for pain and suffering awards is about $350,000. This amount is roughly the equivalent of a $100,000 pain and suffering award that was given in a yard-stick trial in 1978 involving a 21 year old accident victim who was rendered a quadriplegic by a negligent driver (Andrews v. Grand & Toy Alberta Ltd., 1978). You may not be sure whether you wish to pursue a ‘tort action’ immediately after your injury. It is nevertheless a good idea to consult with a Stoney Creek personal injury lawyer to gain an understanding of your rights and options. With the knowledge you gain, you can be sure that you are meeting any necessary timelines for making a claim, and will learn how you can play a part in gathering the necessary medical evidence for your claim, as you go through the recovery process. The lawyers at Stoney Creek ILO also represent clients who have had their insurance disability claims rejected or accident benefits cancelled, and also in situations when clients are being ‘low balled’ by their insurer. 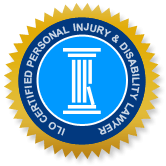 Your ILO personal injury lawyer can act as your go-between with your insurance company, and will make certain that your insurer has all the necessary facts and medical reports that qualify you to get all the benefits you are owed.